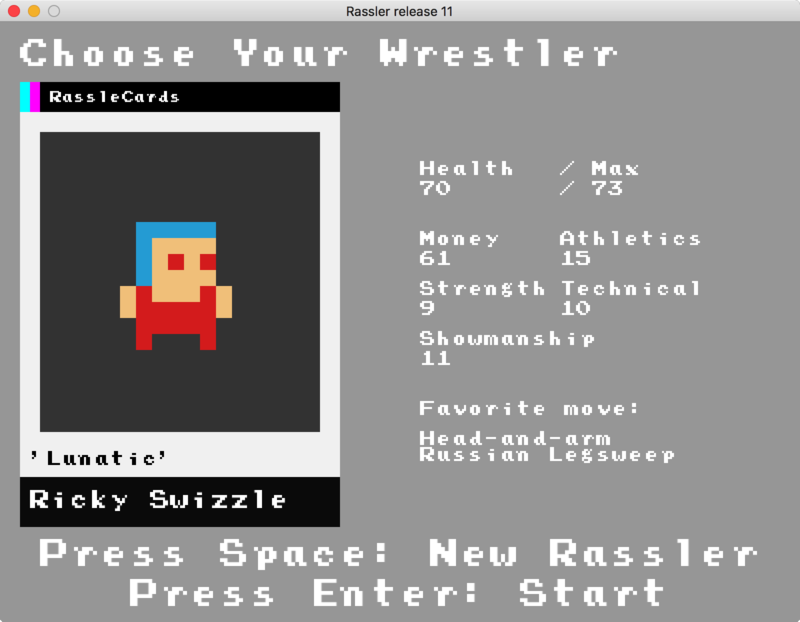 Rassler release 10 (incorrectly listed at Release 11 in the first push! Whoops.) is fresh out of the oven that is my fevered brain! I hope you like it and tell other people how good it is. That stuff helps a lot. We went to a really good indie show here in San Francisco last night, put on by Pro Wrestling Revolution and featuring none other than Jushin "Thunder" Liger. It was pretty amazing to see Liger live, from the front row, in a high school in 2018. "Legendary" doesn't even do the man justice. Wrestlers now have 4 stats, and we've gotten rid of the old ones. Wrestlers are now judged by Strength, Athletics, Technical, and Showmanship. Higher numbers are better. For a level 1 new character the highest you can get is 24 (4d6) in any given stat. This seems super high for a starter, and is likely to change later. Stats do NOT currently factor into how good your matches are, but that's coming in Release 12. Territories now have persistent rosters. Later on this will allow for people to move from territory to territory, or for deaths to occur or new talent to emerge. For now, it just means you wrestle the same 12 people for the entire game. That, too, will be fixed in release 12. Added a new rassler sprite. I'll be adding a lot of color variations in Release 12, too. General note: I feel like I've been biting off too much for these releases. Release 12 is me taking a stab and changing that. Instead of doing big releases every few months, with a lot of changes, I'm going to do smaller releases every week or so. You're a big part of this, too. Your feedback and reviews carry a lot of weight with me, and really do have an effect on how the game is developed.